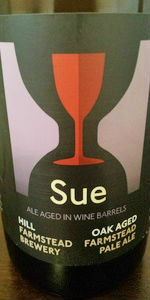 Sue is the wine barrel-aged version of Susan (1891-1975), our grandfather's sister and the namesake of our bright, citrusy Farmstead IPA. Aged for nearly two years, it has developed and evolved into its current manifestation: a complex, lightly tart and delicately hopped Farmstead ale. Onsite pour into globe. Shared by two people. Pours an orange tinted straw color. Thin bubbly head that sticks around for a bit but ultimately settles into a few bubbly islands. Aroma has zesty and sweet citrus candy hops, grassy field, earthy oak. Flavor is smooth and balanced. Lots of citrus including lemon zest, tangerine juice and some grapefruit. Some grain and straw, fruit and oaky earth flavors. Tartness is mild and only a hint of funkiness. Moderate carbonation and medium body. Smooth and perfectly balanced. An excellent brew and especially interesting that this can be made from an IPA. The hop flavors are persistent, but delicate and melded perfectly with the flavors brought out by the Farmstead ale process. a gorgeous beer as expected. nose is grassy, floral, lemon, mint, slightly bitter hops, green and herbaceous, straw, peppery note, a weird spice note that a love but somehow reminds me of incense they had in a dark room at my local hippy store when i was super young. dankness, white grape, must, light funky farmhosue character and some kiwi, pulpy OJ, and candied fruits dancing around in the background. on plate there is white wine throughout and pungent hoppy character in all its piney and resinous bitterness its woodsy and floral, pithy grapefruit, herbaceous green character, orange, hints of oak. overall this one brings a great complexity of flavors and is quite unique. not sure the flavor profile is my preferred style but its so interesting and well executed.